I haven’t been to the Tampa Museum of Art in awhile and since I had free admission by staying at the Le Meridien Tampa hotel, I made sure to take advantage of a visit. 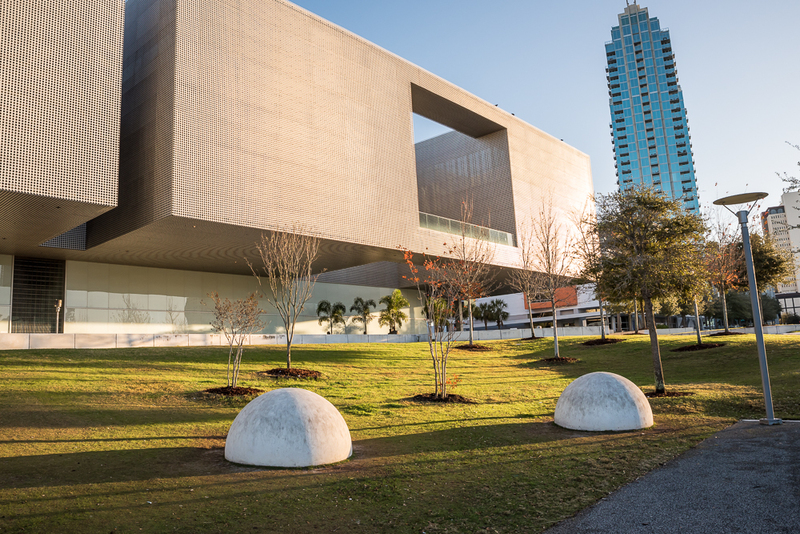 Tampa Museum of Art is a beautiful museum located in the heart of downtown Tampa. The award-winning building was built in 2010 by architect Stanley Saitowitz and has become an icon at Curtis Hixon Park. When you walk into the museum, you’re in a big open, white space. Guest services, the cafe and the gift shop are to your left with some lounging areas around the lobby in the front. The galleries and exhibits are on the second floor where you take the beautiful glass-enclosed staircase. The museum features an impressive collection of contemporary art as well as Greek and Roman antiques. Every time I look around a museum, I can’t believe there are actual pieces of history from the BC era. My mind can’t even comprehend how long ago that was! It’s fascinating reading the story behind some of the pieces. I particularly took interest in the Greek Articulated Doll that dates back to 5th century BC. These dolls were for children to play with and were buried with children in their graves. Most toys would be made of perishable materials, but these survived since they were made out of terracotta. The contemporary art and traveling exhibits were really interesting too. I loved the display of fashion designer Norma Kamali’s work. It’s a first of its kind fashion exhibition for the Tampa Museum of Art titled NORMA KAMALI: NEW CITY - FASHION+ART+CULTURE and it’s on display from June 20 through September 25, 2016. If you’re into fashion shows, the eighth annual event, CITY: Fashion+Art+Culture, will feature a runway show by Norma Kamali, who will present iconic works spanning her 40-year career as well as new designs launching for the Spring 2017 collection. Some other fun exhibits going on now through September 2016 are From Dada and Op to Color Field and Pop: 50 Years of Prints from the Permanent Collection and Peter Max: 50 Years of Cosmic Dreaming. As I started reading more information about this museum, I had no idea it offered so many tours, lectures, classes, programs and events. I definitely need to take advantage of some of those! Downtown Tampa Fourth Friday sounds like an awesome event that involves a bunch of cultural venues, restaurants and attractions. If you get a chance, make sure to stop by the museum at night because the colorful LED light show is a beautiful site to see. It’s designed to look like an “electronic jewel box sitting on a glass pedestal”. You should also stop by the indoor/outdoor Sono Cafe operated by Mise en Place, one of Tampa’s top restaurants. We had brunch outdoors and it was one of the best brunch experiences we’ve had in Tampa. The view is gorgeous and the food was outstanding. ADMISSION: General $15, Seniors/Military/Florida Educators $7.50, Students with ID FREE.